SECURITY companies in the company have been urged to properly train their guards. Aviset Security and Training Solutions trainer Max Ananuka, who trained six Mainland Holdings' security guards on the basic use of batons last week, said many security firms were operating illegally without providing proper training to their static guards. "The security firms should comply with the National Security Authority by-laws to provide basic baton and weapons training to their guards to use while providing security services to their respective clients," he said. "Many security firms are operating illegally around the country. "They have not met the standard set by the National Security Authority to provide baton and weapon training to their guards." Ananuka commended Mainland Holdings for complying with the National Security Authority regulations by engaging a locally-owned registered security training solution company to train their guards in the past three months. He who was a former police special services division trainer for 15 years and holds a level 4 training certificate. Ananuka said he had conducted two trainings already on the use of baton and access control. 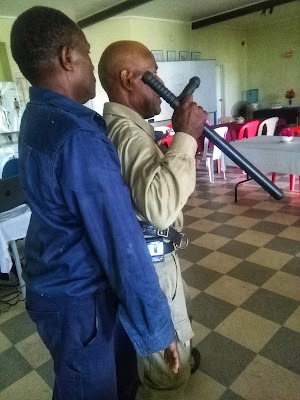 Aviset Security and Training Solutions trainer Max Ananuka (right) demonstrating how to use a baton to defend himself from an attacker at Mainland Holdings' Graham Goudie Training Centre at 6-Mile in Lae last Thursday. This is the third batch of guards to undertake basic baton training. 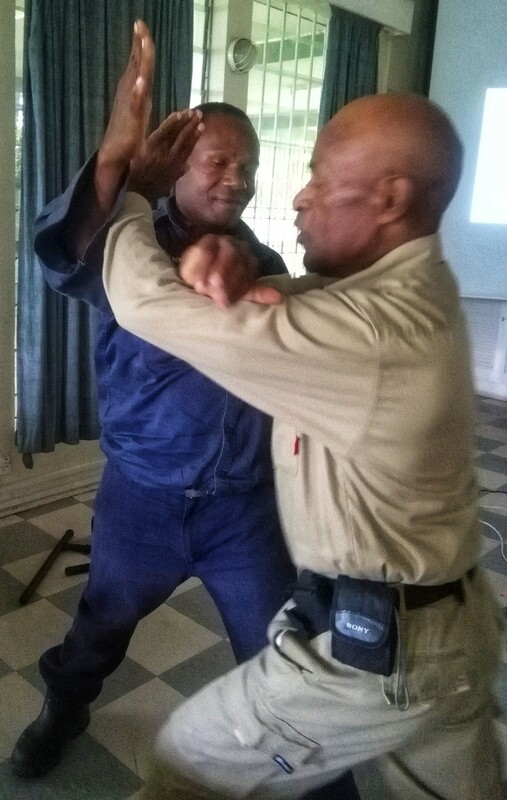 "I thank the company for realising the importance of providing training to its security guards on the use of batons at their workplace," Ananuka said. "We are looking forward to continue to provide training to upskill the guards to enable them to perform their duties more professionally." The one-day baton training was witnessed by Mainland Holdings' security supervisor William Wareka. Mainland Holdings security manager Jacco Haasbrolk congratulated the guards for undertaking the baton training. 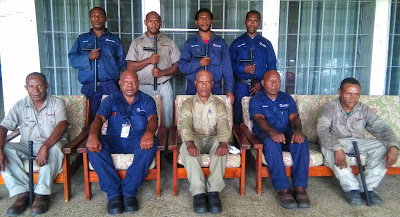 Six Mainland Holdings security guards with Avisat Security and Training Solutions specialised trainer Max Ananuka (centre) after the completion of basic baton training at Mainland Holdings' Graham Goudie Training Centre at 6-Mile in Lae last Thursday. He thanked Aviset Training and Training Solutions for providing the training. He said the security guards wuldnow be using batons as their weapons at their workplaces. "We will continue to send more of our guards to attend similar training as we increase the number of our security guards,"Haasbrolk said. Aviset Security and Training Solutions managing-director Willie Gumaim thanked Mainland Holdings for engaging his company trainer Ananuka train the guards on the basic use of batons. "It is very important as the company has to comply with the National Securities Authority regulations to properly train their guards on the use of batons to empower them to perform their duties more effectively,"he said. 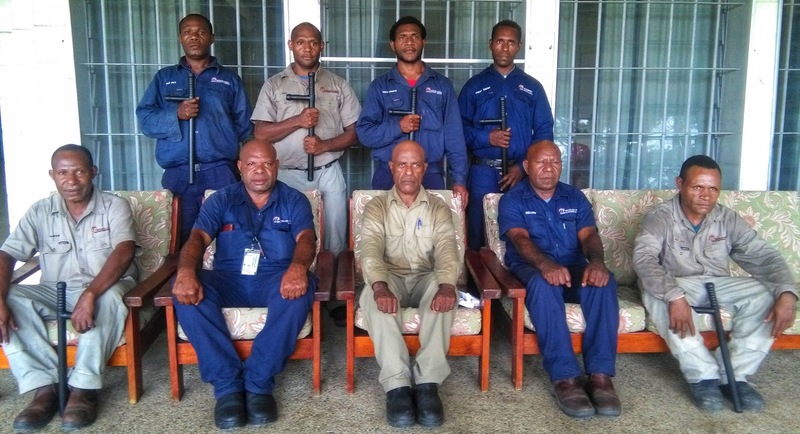 "I would like to see more security companies operating in Lae use our training company to facilitate their training on the use of batons, as it is the legal weapon for security companies. "We also provide training on the use of firearms to ensure the specialised guards providing escorts have permits for using it. "The baton is part of the uniform of security guards. "They should be trained on how to use the baton while executing their duties as it is allowed under the laws of this country. "Our training company is fully registered with Investment Promotion Authority and National Securities Authority to provide various types of security training from the use of batons and firearms. "We have highly-skilled, trained and certified former police and defence force officers who have attended various trainings in PNG and Australia and are qualified to provide security training to the various companies in PNG." The retired police chief inspector and former contingent commander of Bougainville operations and Sandline Crisis operations commander, added that the regulating security body should carry out checks on all the security firms in PNG. This is to ensure they have fully complied with the amnesty period which ended in February to provide proper training to all their guards.